Jackie Gerstein at UsergeneratedEducation pushes us constantly to think through the educational mandates and silver bullets to focus on students and their learning. What will best guide students to become thinking, caring, productive persons? The first thirty-eight slides of her presentation [ below ] provide thoughtful background theories and key questions to consider for our classrooms. Slide 8: Something to do. We lost this when state standards developed in the 1990s. We removed the authenticity of doing and replaced it with intangible verbiage, which would have been the learning had we continued with the doing. Slide 22: The most important question for classrooms – because doing is learning. Slide 27: Love this question. After all, aren’t we trying to make the world better? Slide 29: The Soft Skills – the process of planning, searching, gathering, sharing, collaborating, listening, debating, revising. The skills we learn through doing and doing together. With each of these first thirty-eight slides, I say – that’s what what we need to consider! That’s our goal… I appreciate that Jackie shares these slides and continues with examples in the latter part. Refer to the work of those who focused on learning as opposed to standards or skill objectives. 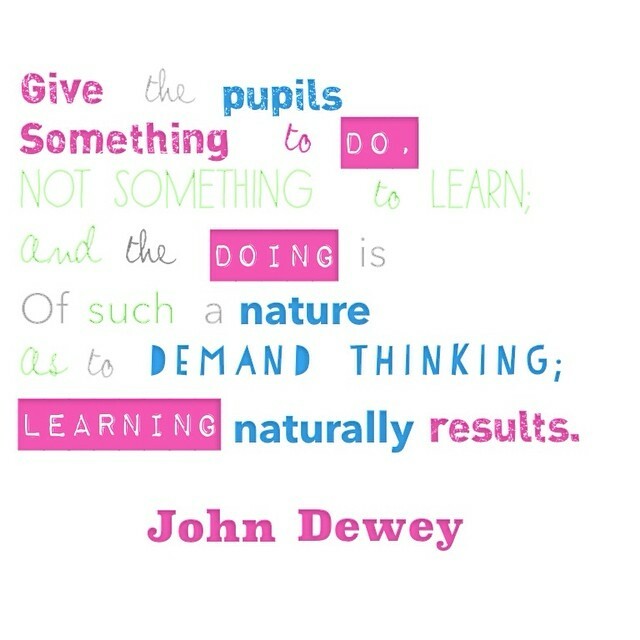 Review the work of Dewey [and here], Vygotsky, Bruner, Papert [and here]. For Language Arts, see the work of James Moffett [ and here ]. Consider these ideas and questions. Consider the students in your classroom. When did we lose the doing? We learn what we need while doing something. We learn the strategies as we go, with support from our collaboration with peers or colleagues. Every time we do something, we build on what we learned before. That is the power of project-based learning. Students today are fading out in classrooms, bored with the posted objective; they want to learn what is of interest to them — or a question, an issue that piques their interests. With information readily available, it is the questions asked about that information that leads to learning and understanding it; it is what we want to do with the information that allows us to learn deeper. It is the sharing and collaborating with a shared purpose that propels us to do more and better to discover an answer and produce the results for others to contribute; this is learning. It fits in any classroom. How will we as educators bring the power of the question and the doing back into our classrooms?